Whose weak hands and knees are to be strengthened? Does it refer to our own or others’ around us? What do hands, knees, and feet represent here? Literal body parts? How can we “pursue peace?” Who are we to pursue peace with? How could one come short of the grace of God? What will be the result if some sin is tolerated (15)? Why was Esau described as immoral and godless? What other things did he do or not do in his life that shows this moral depravity? What does it mean that he found no place for repentance? Knowing that God discipline those who sin should motivate us to action. Discipline is good. It shows us that we are God’s children. It is designed to correct us. But if we don’t sin, then there is no need for correction and no need to experience the sorrow connected with discipline. If we have already sinned it would be better to repent quickly so that we won’t have to remain under God’s hand of discipline long. Verses 12-13 refer to our spiritual lives in figurative language as of our body. Hands, knees, feet, limbs, joints. I believe these refer to any area of our lives that has a problem and needs correcting. See the end of verse 13 which says, “but rather be healed.” The goal of discipline is correction and restoration. We should take the steps necessary to correct our sin and repent so that we will be restored in our relationship with God. This means addressing sin in every aspect of our lives. Verse 14 – Pursue peace and sanctification. This verse shows us a key point of this chapter. We are to take the warnings about discipline to heart. That means the direction of our life has to change. Here it tells us to pursue peace with all men. This doesn’t happen naturally. We have to make an effort and take initiative. How? Perhaps that means calling up an old friend and apologizing for a past mistake. Maybe it means letting go of some resentment and forgiving someone who wronged us. In addition to our relationship with others, the author encourages us to pursue a closer, holier relationship with God by being sanctified. While God is the one who sanctifies us, we are not a third party bystander. Rather we are a participant. It is our responsibility to respond to the conviction and leading of the Spirit by rooting out sin in our hearts. Do not be content with the level you are at now in your walk with God. Always push forward to seek to grow closer and closer to Him and become more and more like Him. God’s grace is completely free. We could never deserve it. He doesn’t look for a worthy recipient since none of us are worthy. That is not what this means. I believe that it means as recipients of God’s grace, we are called to a high standard of living. We are to live our lives worthily of this high calling. Remember Jesus’ parable about the pearls and the swine? Some people treat God’s grace like the pigs treated pearls. They cast it aside without a second thought. They take advantage of it or take it for granted. Doing this is very dangerous. Casting aside the grace of God could allow a seed of bitterness to take hold, which could then grow and spread until it affects many in the church. Among the Hebrew readers, there were a number who were still on the fence about Christ. They had been taught about Jesus, but they hadn’t yet given their lives to Him. God extended His offer of grace to them, and they needed to earnestly accept it rather than toying with it. The author gives Esau as an example of someone who didn’t appreciate God’s blessings in his life. He spurned his own birthright. He lived for the moment without considering the future. His god was his stomach. His fleshly desires drove him. Later on he regretted this, but it was too late. This verse is a reminder that many may feel regret or sorrow about their past decisions (including decisions about rejecting God), but that normally will not lead to true repentance. Like we learned in Hebrews 6, for those who have been exposed to the grace of God, and shared in the blessings that His people receive, but finally reject God’s offer of grace, it is impossible to renew them again to repentance. Esau seems like he fell into this category. The warning is to not presume upon God’s grace. Do not think you will repent or follow God later, someday in the future. Sin should not be messed around with. Repent of it immediately. Serve God and seek God today, not tomorrow for tomorrow may be too late. What event is described in verses 18-21? What was the people’s reaction when God descended onto Mt. Sinai? Why were they so afraid? What does Mount Zion refer to? Have we already “come” to all of the things listed in verses 22-24? What is the author’s main point in this section of Scripture? Compare and contrast the two covenants? This section of Scripture contrasts the old and new covenants. Remember that one of the chief themes of the book of Hebrews is the superiority of Jesus. One proof of that is that the covenant which He mediated is better than the old covenant. These verses show some of the ways that the new covenant is superior. 18-21 – See cross-references. The author is describing a real event when God descended upon Mt. Sinai. The people were not allowed to step foot on the mountain or they would die. God’s presence was clouded by a storm and announced by a trumpet call (probably a thunderous call never heard before or after in the world again). It was a terrifying experience. Why? God’s power and holiness were awesome. It was so awesome that the people wanted it to stop. They couldn’t bear it. They later requested that only Moses approach God so that they wouldn’t have to experience this again. This shows the distance of the relationship between man and God at that time. God’s power and holiness were emphasized to remind people of their sin and their desperate inadequacy to solve this problem on their own. 22-24 – This Mt. Zion doesn’t refer to the actual mountain in Israel. Rather it refers more generally to the kingdom of God. Specifically it shows a different way that God deals with believers in NT times (contrasted with the way God dealt with them in OT times as shown when He gave them the law at Mt. Sinai. Go through these verses phrase by phrase and discuss. What can we learn from the Israelite’s in the wilderness according to verse 25? What application is there for us in this? When will this “second shaking” take place and what does it refer to? What are the things which cannot be shaken (27-28)? What acceptable service can you offer to God? What attitude should we have towards Him? 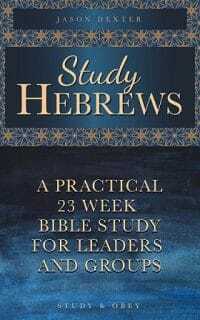 The warning – Hebrews is full of warnings. This tells us not to reject God. What is the opposite of this? To submit ourselves to Him completely. The wilderness Israelites saw God’s miracles. They experienced them. They were healed by Him, saved by Him, delivered by Him. They were taught by Him. They experienced the blessings of being His people every single day (manna) during their time in the wilderness. Yet they didn’t have true faith. They continuously doubted God and rebelled against Him. God warned them over and over and they heeded Him not. The result was that the entire generation (except Joshua and Caleb) met their early deaths in the wilderness without God. We have the benefit of even more teaching than they do. We can see God’s plan as it has been revealed throughout history. We know of Christ’s death and resurrection. The Bible has been completed. More prophets, teachers, and apostles have come. The lives of the faithful saints have been recorded for our benefit. This means that we are without excuse. If we don’t submit ourselves to God now after all of opportunity He has given us, we will be more culpable than the wilderness Jews. Verses 28-29 – We have so much to be grateful for. All believers are part of an enduring kingdom that will never be shaken, never be defeated. Earthly kingdoms rise and fall, but the kingdom of God endures forever. Instead of presuming upon God’s grace, His grace should fill our hearts with thankfulness. This thankfulness should be like a well springing up in our hearts all the time. His grace should motivate us to serve Him with all of our hearts. We should not forget what kind of God we serve. He is a big God, awesome in power, holiness, and splendor. Remember from the first part of Hebrews 12 that we are in a race. We must give every last ounce of strength that we have for Him. We should serve Him with our whole hearts soul, and very being. He deserves it. Application: What does God want you to apply in the coming week? Be specific!